Did A Methane Burst Cause the end-Permian Extinction? The end-Permian extinction is associated with a mysterious disruption to Earth's carbon cycle. Here we identify causal mechanisms via three observations. By obtaining images and spectra at the same light echo position between 2011 and 2014, we follow the evolution of the Great Eruption on a three-year timescale. The 10th Annual Astrobiology Graduate Conference (AbGradCon), an interdisciplinary conference organized by and for graduate students and early career scientists, will be held at Rensselaer Polytechnic Institute in Troy, NY during July 27 - 31, 2014. The Gemini Planet Imager (GPI) is a dedicated facility for directly imaging and spectroscopically characterizing extrasolar planets. Our understanding of the processes that are relevant to the formation and maintenance of habitable planetary systems is advancing at a rapid pace, both from observation and theory. While it is well recognized that interstellar grains are made of amorphous silicates and some form of carbonaceous materials, it remains debated regarding what exact chemical and physical form the carbonaceous component takes. Earth is the only known example of an inhabited planet in the universe, so the search for alien life has focused on Earth-like worlds. In another step forward in the search for habitable planets, a team of researchers based out of the US and Chile announced that they have located a large swarm of comets and gas moving in a cloud around a nearby star. Microbiologist Jill Mikucki first saw a photo of Blood Falls during a class for her master's degree at Portland State University. It immediately captivated her. In 1980, Alvarez and colleagues proposed that, in the transition from the Cretaceous to Paleogene, a large impactor collided with Earth being the cause of the mass extinction occurred at the limit K/Pg. Scientists searching for habitable planets beyond Earth shouldn't overlook F-type stars in favor of their more abundant, smaller and cooler cousins, according to new research from University of Texas at Arlington physicists. Emission from a class of benzene-based molecules known as Polycyclic Aromatic Hydrocarbons (PAHs) dominates the infrared spectrum of star-forming regions. How Do Tardigrades Survive Environmental Extremes? If you have been watching the new series "Cosmos" recently then you have see Tardigrades or "water bears" featured. These creatures are remarkably resistant to a wide range of conditions that humans would consider extreme - if not deadly. A research team in Spain has the enviable job of testing out new electromechanical gear for potential use in future missions to the "Red Planet." Recent results from the Kepler mission indicate that super-Earths (planets with masses between 1-10 times that of the Earth) are the most common kind of planet around nearby Sun-like stars. Imagine you're a leech, happily making a living on a turtle in some quiet, freshwater pond. What do you do when winter comes and temperatures in your warm little habitat begins to dip below freezing? 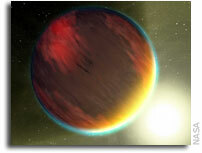 HARPS and it Kepler results indicate that half of solar-type stars host planets with periods P<100 d and masses M < 30 M_E. Despite years of high accuracy observations, none of the available theoretical techniques has yet allowed the confirmation of a moon beyond the Solar System. Broad infrared emission features (e.g., at 3.3, 6.2, 7.7, 8.6, and 11.3 microns) from the gas phase interstellar medium have long been attributed to polycyclic aromatic hydrocarbons (PAHs). Scientists at the U.S. Naval Research Laboratory (NRL) are part of a research team that has detected water vapor in the atmosphere of a planet outside our solar system. Models of planet formation have shown that giant planets have a large impact on the number, masses and orbits of terrestrial planets that form. The "holy grail" in planet hunting is the detection of an Earth-analog: a planet with similar mass as the Earth and an orbit inside the habitable zone. Researchers have pieced together a highly detailed picture of feeding relationships among 700 mammal, bird, reptile, fish, insect, and plant species from a 48 million year old lake and forest ecosystem. Geologic cycles act as a climate control, releasing and absorbing atmospheric carbon dioxide in a balance that helps keep the planet not too hot and not too cold. Sea anemone shows a genomic landscape surprisingly similar to human genome, but also displays regulatory mechanisms similar to plants. Researchers from the British Antarctic Survey and Reading University have demonstrated that, after over 1,500 years frozen in Antarctic ice, moss can come back to life and continue to grow. Why Is NASA's Astrobiology Program STILL Ignoring "Cosmos"? NASA's Astrobiology program continues to totally ignore "Cosmos" - even when it offers millions of viewers a full episode on Astrobiology. Alien planets circling the most common stars in the universe may often have strange lobster-shaped oceans on their surfaces, researchers in China now say. Polycyclic aromatic hydrocarbons (PAHs) have been observed in O-rich planetary nebulae towards the Galactic Bulge. It might be the ugliest diamond you'll ever see, but within this brown sliver of carbon is a gem of a find for a University of Alberta scientist working to unravel an ocean-sized mystery deep beneath the Earth. Chemists at The Scripps Research Institute (TSRI) have devised a greatly improved technique for making amino acids not found in nature. Favorable conditions for life on Earth are enabled in part by the natural shuttling of carbon dioxide from the planet's atmosphere to its rocky interior and back again. Protoplanetary disks are vital objects in star and planet formation, possessing all the material which may form a planetary system orbiting the new star. We constructed a 6-degrees of freedom rotational model of Titan as a 3-layer body consisting of a rigid core, a fluid global ocean, and a floating ice shell. Detection of life on other planets requires identification of biosignatures, i.e., observable planetary properties that robustly indicate the presence of a biosphere. The new incarnation of "COSMOS" hosted by Neil deGrasse Tyson debuted the other night. Highly anticipated, this new effort seeks to reboot, rekindle, and revitalize the indelible impression that its predecessor, hosted by Carl Sagan, made on many of us back in 1980. 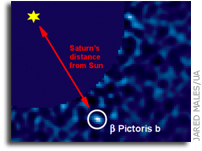 University of Arizona researchers snapped images of a planet outside our solar system with an Earth-based telescope using essentially the same type of imaging sensor found in digital cameras instead of an infrared detector. Three new planets classified as habitable-zone super-Earths are amongst eight new planets discovered orbiting nearby red dwarf stars by an international team of astronomers from the UK and Chile. Mysterious dark finger-like features on steep Martian slopes that lengthen downhill during the Red Planet's warm season could be caused by flowing water, scientists at Southwest Research Institute and the SETI Institute reported. In the mid-1970s, the first available satellite images of Antarctica during the polar winter revealed a huge ice-free region within the ice pack of the Weddell Sea. This ice-free region, or polynya, stayed open for three full winters before it closed.